Apple introduced many new features in iOS 8 that can make your iPhone or iPad easier to use and more useful. 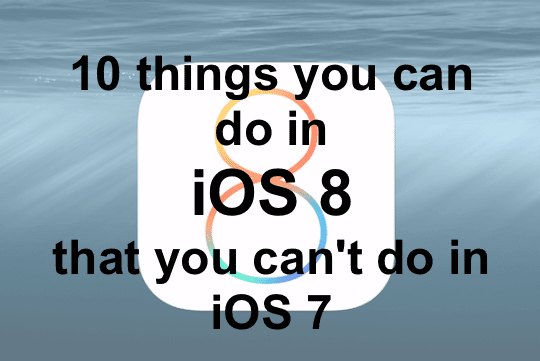 We will specific How-To’s and tips in additional posts, but here is a brief rundown of 10 great things that you can do today that were not possible in iOS 7. For anyone new to iOS, there is also now a built-in Tips app (which cannot be uninstalled unfortunately) which is also a good place to look for quick tips on how to use your iPhone or iPad. Android users have long gloated over iOS users that this has been possible for years, but now Apple has officially enabled custom keyboards that let you interact in lots of new ways, for example swyping across the letters or even using animated GIFs. 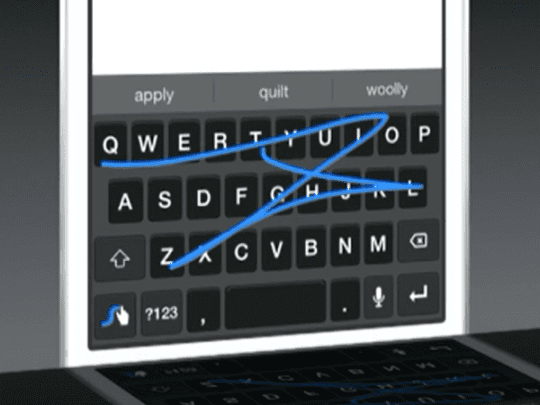 Swype keyboard is one of the most popular custom keyboards for iOS 8. 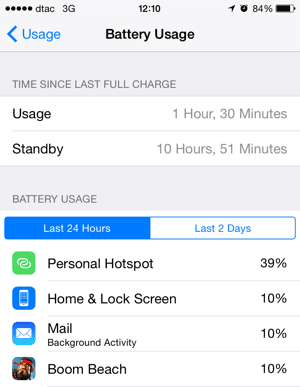 It was nearly impossible in iOS 7 to determine which apps were draining your battery. But iOS 8 lets you easily see what has been drawing the most power, so that you can fine tune and optimise settings such as Background App Refresh. Turn those off to save your battery, at the expense of a longer loading delay in some cases. To do this go to Settings -> General -> Usage and then tap Battery Usage. You will see a complete breakdown for the Last 24 hours, as well as a longer period such as the the last week. In my case, I’ve just picked up a new iPhone so I have only the Last 24 Hours and Last 2 Days options. 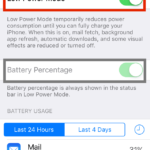 See what’s been eating your iPhone’s battery. 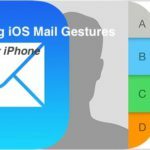 In iOS 7, it was always a hassle to respond to messages and other notifications, because clicking on the notification switched you from the current app to the one that sent the message. 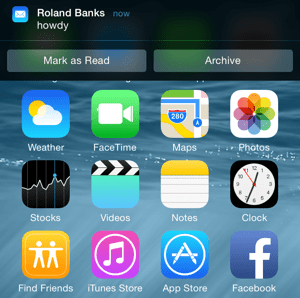 In iOS 8 however, you can simply swipe down on a notification (such as from a message or email) to see the available options such as Mark as Read or Archive. The options shown are different for each application, and depends on whether it supports iOS 8 or not. Swipe down from the top to view relevant actions. 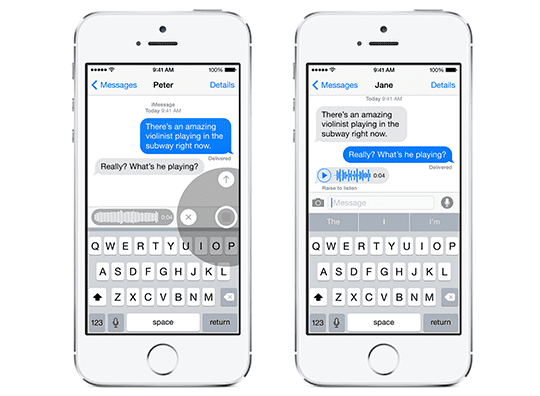 iOS 8 allows you to quickly send a voice recording right within the messages app. Simply hold down the microphone icon that appears to the right of the text entry field, and keep your finger pressed to record audio. Let go with an upwards swipe to send, or a sideways swipe to the left to cancel. The good news is that even users on iOS 7 and earlier can play the message, as it just appears as a .AMR (adaptive multi-rate audio) file attachment. The other person will be able to play your clip using the Play icon within the message. Thankfully, these messages don’t take up much room (they are in compressed AMR audio format) and can be automatically deleted after a certain time period – you can change those settings in Settings -> Messages -> Audio Messages -> Expire where you have the option of 2 minutes or 30 days. 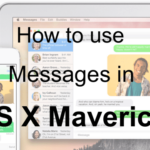 Send a voice clip to another iOS user with a quick swipe in Messages. There is also a similar feature for sending video messages – instead of tapping the Camera icon to display a popup menu, hold down the Camera for a second to switch to a live view with options to send a picture or video. 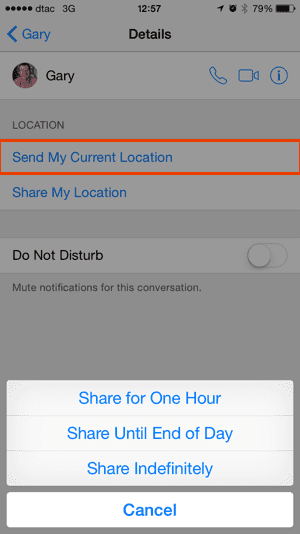 Your iOS friends might not be using the Find My Friends app, but you can still share your location with them either indefinitely or just for a short period. This feature is extremely useful, as it allows you to arrange to meet friends more easily, and it’s all kept right within the Messages app. To get started open Messages, select message then click the Details button in the top right. You’ll see a screen like that shown below, so then choose Send My Current Location to let the other party see where you are right now, or Share My Location which opens a popup with various options (1 hour, 1 day or indefinitely). Share your location temporarily with ease. If you are in a particularly chatty message thread and want some peace and quiet, but don’t want to enable Do Not Disturb for everything, it can be turned on for individual message threads (and groups). 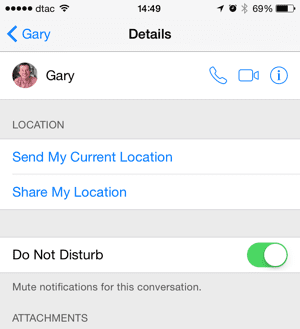 Simply select a message, tap Details and then tap the Do Not Disturb button. You won’t receive any more notifications for the selected thread until you turn the feature off again. Unfortunately, there isn’t a way to mute the conversation for a fixed time period – hopefully that’s something that might be added in a future update. Want to be left alone? Turn on Do Not Disturb. In iOS 7 was the ability to create super slo-mo videos at 120 frames per second. That feature has been enhanced in iOS 8 on the iPhone 6 to support 240 frames per second, but there’s also a new time-lapse mode that lets you create hilarious super fast videos. To use time-lapse mode, just go into the camera app on your iPhone and slide the setting at the bottom to Time Lapse mode and hit the red record button. The camera will take a picture every few seconds (the precise interval depends on the length of the clip) and when played back (at normal speed) will make everything play back much faster than normal. The effect works best if you place the phone somewhere very steady so that it doesn’t move between shots. 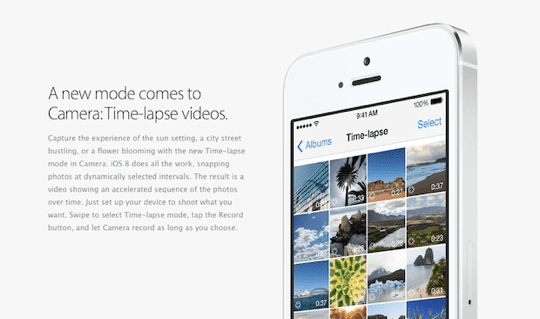 Time-lapse has been available in third-party apps before, but is not built into iOS 8. Every time you select an item such as a picture and use the Share button, you’ll see the familiar popup as shown below that shows you applicable actions – for example share the photo via message or send it to Facebook. 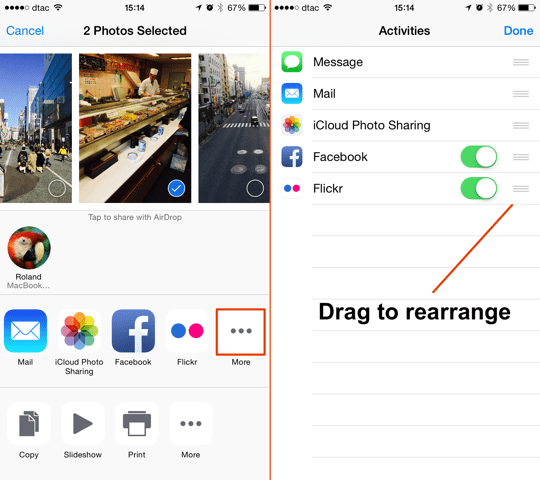 iOS 8 lets app developers create app extensions, which means that any app can register its own little widget that appears in the share sheets. If you choose to share an image and you’ve installed an image editing app that includes these special extensions, it will show up in the share sheet popup when you attempt to share the image. The benefit here is that you often don’t even need to open a particular app to do something with it. 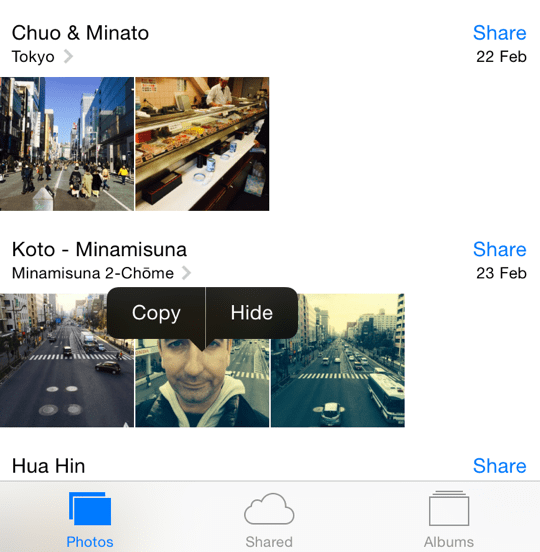 New sharing options in iOS 8 use app extensions to let you do much more with your content. You can also customise which sharing options you see in the menu by tapping the More button as shown below then drag each item to rearrange how you want. 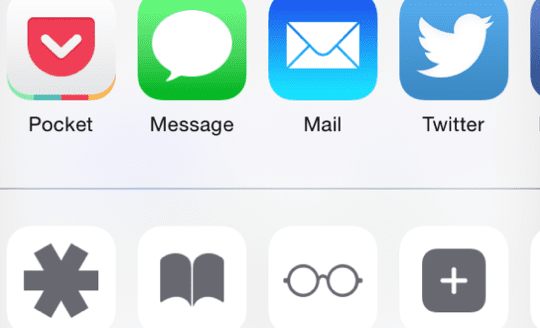 Tap More to rearrange or hide the sharing options. Sometimes you have so many photos that it would be nice to hide some that you don’t necessarily want to see in the Collection view. To do this, tap and hold any photo to display the options (Copy and Hide). If you choose to hide a photo, it will still be available in the album view, just not in the normal Photos tab. Want to hide that photo of you that didn’t turn out so well? Just tap and hold for options. 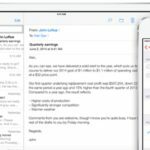 The Today screen has received a minor cosmetic refresh in iOS 8, but it can also display additional information from compatible apps, rather than just from the built-in apps. Swipe down from the top of your screen to bring up the Today view, then scroll to the bottom and tap Edit to see the available options. You can add or remove all the usual items (Stocks, Reminders, etc) and change their order, and you can now also choose from apps that use extensions. In the example below, I can add the Linked In widget that shows who has viewed me in one simple swipe down. 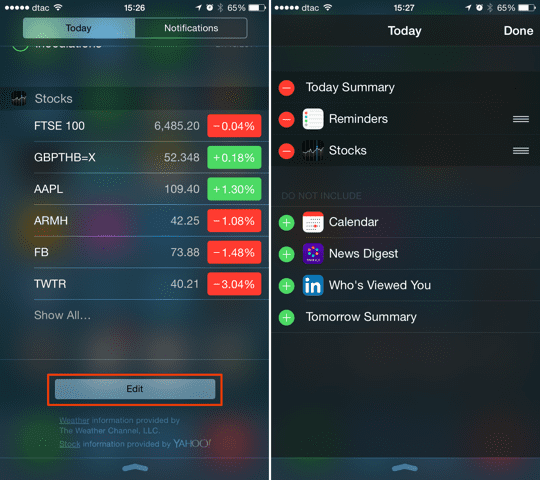 Apps that use extension widgets can be added to your Today view – such as LinkedIn and many more. iOS 8 is definitely an improvement over iOS 7 in terms of the functionality and features, and the overall aesthetic design. 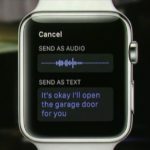 It has lots of powerful new features, which are only just starting to be exploited – in future, the amount of customisation will only be limited by the imagination of application developers, so it’s definitely a step in the right direction. Look out for more posts about iOS 8, and enjoy using this great upgrade on your iPhone and iPad.